Graz is located in Austria, a country in central Europe. 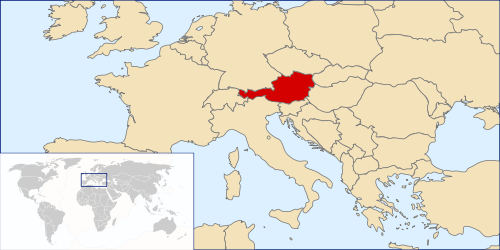 The map below shows the location of Austria in Europe and the world. Graz is located in the southeast of Austria. It is the second biggest city in Austria (after Vienna), with population of about 270,000. It is also a capital of the Austrian federal state of Styria (in German: Steiermark). 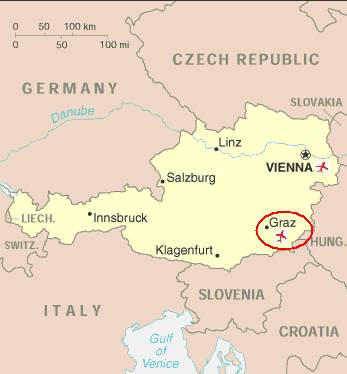 The distance between Vienna and Graz by road is about 190 km (about 120 miles). Information on how to get to Graz by air or land is listed below. 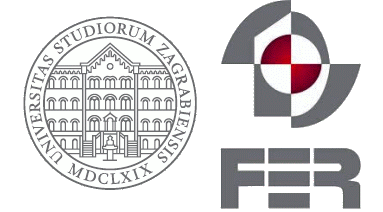 For more details, the best source of information is the tourist association of the city of Graz – Graz Tourismus. Graz (international) Airport, also known as Thalerhof (IATA airport code: GRZ), is located about 10 km to the south of the city center. It has regular flights to Vienna, as well as other cities in Austria, Europe and beyond. (See destinations map). Graz airport is serviced by several major and budget airlines, including Austrian Airlines, Lufthansa, InterSky, TUIFly, and Ryanair. For best connections if arriving from overseas look for flights via Vienna, Frankfurt, or Munich (Austrian/Lufthansa/Star Alliance), or via London Stansted (Ryanair). The most convenient way to get from the airport to the city is by public transportation. Bus: The bus stop is right outside the passenger terminal, right next to the arrival area. The bus takes you to Jakominiplatz (City Centre) and to Hauptbahnhof (main train station). As of July 2018, the bus ticket costs €2.30 one way. Train: The Flughafen Graz/Feldkirchen (S-Bahn-Linie S5) railway station airport is within walking distance from the airport (300 m, about 5 minutes on foot). The travel time to the airport from Graz main station (Hauptbahnhof) is approximately 12 minutes by regional train. Taxi: The taxi rank is directly outside the passenger terminal, next to the arrival area. Upon arrival to the city, there is an extensive and efficient tram and bus network. Local trains from Graz to Vienna depart every two hours (travel time around two and a half hours), and to Salzburg every two to three hours (travel time about 4 hours). International direct trains to/from Graz include Zagreb (Croatia), Ljubljana (Slovenia), and Budapest (Hungary). Graz is well connected with major highways. You can drive to Graz by car via the motorway A2 from Vienna (approx. 190 km, 2-2.5 hours), A9 from/via Linz (approx. 220 km, 2.5 hours), A9/A10 from/via Salzburg (approx. 280km, 3.5-4 hours), or A2 from/via Klagenfurt (150 km, 2 hours). Please note that the actual driving time depends very much on traffic conditions. For other departure points, we suggest to use the Via Michelin route planner. A national and international driver’s licence, car papers and all relevant insurance documents are necessary to enter Austria with a vehicle. If you decide to rent a car, you can do it at any major airport, as well as in the city, but it is generally a good idea to make your reservations in advance. Note, however, that Graz is best explored on foot, and that it has very good public transportation. Also, much of Graz is a short-term parking zone (Kurzparkzone in German); so parking in the garage or in the streets in the town centre may end up being very expensive. You can check the weather in Graz here. Nationals of some countries will need to obtain a visa to travel to Austria; check whether you need one with the Austrian Federal Ministry for Europe, Integration and Foreign Affairs. In most cases, in addition to other documents, an invitation letter will be required to be provided for the visa applicant. The conference policy is that invitation letters can be issued only to registered authors of accepted papers and conference committee members. Registration fees must be paid in full before the letter is provided. Letters will only be sent by e-mail or fax and only to the authors registered for the conference. Please note general visa processing time may vary from one week to three weeks. If you need a visa, make sure to apply for one well in advance.